Are There Killer Bees in Austin, Texas? Are There Killer Bees in Austin? It sounds like a plot straight out of a B movie (pun shamelessly intended), but South American scientists actually did breed European bees with African bees with the seemingly harmless goal of producing bees that could crank out more honey. The hybrids were, in fact, good at producing honey, but they were even better at protecting their hives. The aggressive bees escaped from a lab in 1957 and slowly spread northward before arriving in Texas in 1990. As they moved north, they continued to breed with other bees, and some of them have mellowed out a little. Nonetheless, the aggressive trait still survives in some hives. One of the most horrific attacks occurred in June 2013 in Moody, 80 miles north of Austin, when a man on his tractor was killed after being stung as many as 3,000 times. Though no deadly attacks have been reported within the Austin city limits, a man in Pflugerville, just north of Austin, was hospitalized in August 2012 after stumbling upon a swarm of over 100,000 bees in a warehouse. The man was attacked while trying to move a cabinet with a hive hidden inside. Experts at the Texas AgriLife Extension Service say that, if you’re attacked, you should cover your face with your hands and get as far away from the hive as possible. The bees consider any area within 400 yards of the hive their home territory, which they must protect. Your next priority is to get the stingers out because they can continue to inject venom for several minutes, even after the bee is long gone. If you encounter a swarm of bees, you can probably just avoid them. 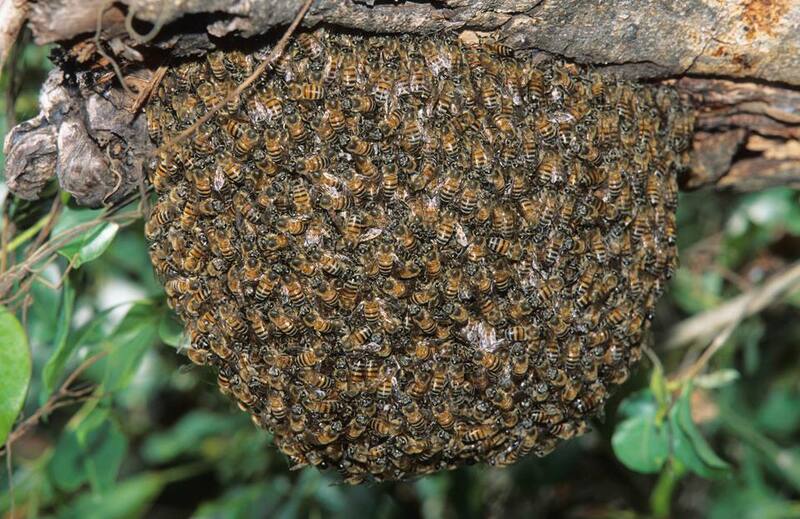 Bees generally only swarm when they are in the process of moving to a new home, so they will most likely move on soon to continue their house hunting. Just make sure you haven’t provided them with a cozy space to live, such as a large tree cavity. Africanized bees are not as particular as standard honeybees when selecting a place to call home. Sometimes, they even nest near the ground, in water meters, storage buildings and neglected boats. They sometimes invade attics if pipes and vents leading into the attic are not well sealed. They may even congregate in chimneys or any mid-sized cavity they can find on the outside of your home. Also, be aware of the stimuli that cause bees to attack. Their aggressive attack mode can be triggered by loud noises (car engine revving, kids screaming, dogs barking), vibrations (lawnmower, weedeater, stereo with heavy bass) and fast movements (excited dogs running in circles, children chasing each other). In summer 2018, Austin experienced a sudden uptick in Africanized bee attacks. There were 14 bee emergencies in the span of only two months. Some of the larger colonies had developed in the walls of abandoned or neglected buildings. One particularly disturbing report showed honey seeping from an electrical outlet inside a home. The city had just experienced a major heat wave with over a dozen days in a row over 100 degrees. However, experts have not yet figured out what the cause of the increase in attacks might have been. There’s no doubt that humans are grumpier in the heat, so maybe it’s getting to the bees too. Before you declare war on all bees, however, and blast them indiscriminately with pesticides, remember that we humans need them. Bees play a vital role in pollinating plants. If you don’t think you’d be bothered by a few less pollinating plants, consider this: Without bees, it would be nearly impossible to grow most vegetables, nuts and fruits. In some highly polluted areas in China where the bees have been decimated, thousands of people have to manually pollinate pear trees -- flower by flower. Bee colonies worldwide have also fallen victim to Colony Collapse Disorder, in which bees leave a colony and simply never come back. The cause is unknown, but it’s affecting beekeepers and farmers across the globe. After reaching a crisis point in 2008, the EPA reports that cases of Colony Collapse disorder seemed to decline. Nonetheless, we need millions of bees to keep our food supply healthy. So, please don’t kill any bees if you don’t have to!